Subscription fees are a one-off payment for each season, these are due by October 15th. Please refer to the table above for the types of subscriptions available. 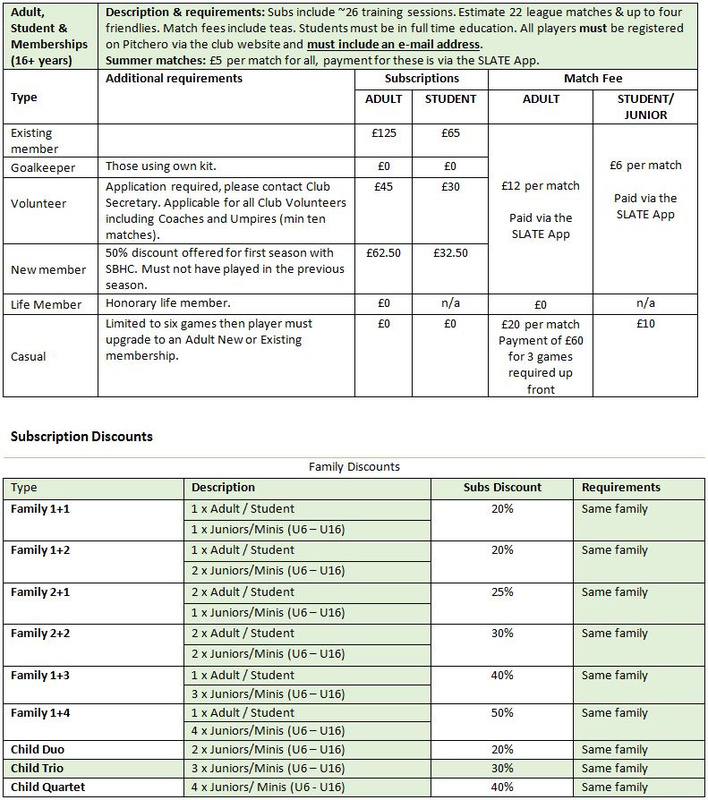 Please note if more than one family member plays for SBHC you may be entitled to a subscription discount, please see the second table above. Volunteers: Volunteers are entitled to a reduced Subscription as detailed below. Please complete the Volunteer Form attached below and return it via e-mail to Robbie Campion the Club Secretary: secretary@southberkshirehockeyclub.org.uk Once you have been notified that you have been accepted as a Volunteer please make payment accordingly. Every member playing adult hockey (excluding Honorary Life Members) must pay Match Fees. Match fees are payable weekly via the Slate mobile phone App. Please note SBHC will operate a strict no pay, no play/train policy which will be enforced this season. If persistent nonpayment of fees occurs members will be subject to an additional £10 payment towards the administration cost of chasing overdue fees. Please refer to the table above for the breakdown of match fee costs. Reduced Fees: These are available (without discrimination) to persons who can reasonably demonstrate that they are unable to afford the Subscription and Match Fees. SBHC gives assurances that our procedures in this matter will be discreet and confidential throughout the process. All members that are accepted under this category will enjoy identical voting rights and privileges to our other standard categories of membership. Please contact secretary@southberkshirehockeyclub.org.uk to discuss. administrator@southberkshirehockeyclub.org.uk so payment can be allocated correctly. By applying for registration, you are agreeing to comply with the club’s constitution, terms and conditions and code of conduct. In accordance with the Data Protection Act 1988, you understand that membership of South Berkshire Hockey Club requires the storage and processing of my personal details entered on this membership form. This information may be shared with coaches and other appropriate volunteers within SBHC for the purposes of running and administering the club. This data will not be disclosed to any third parties.